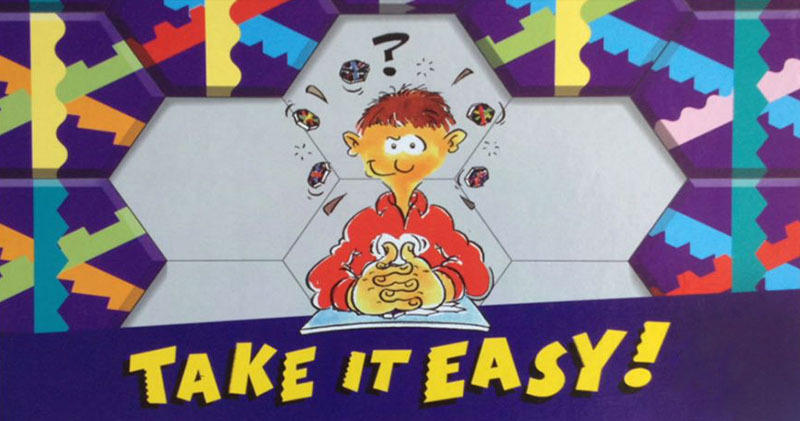 Variations of Take it Easy! Some of these variants involve different rules for the placement of tiles; others suggest different methods of scoring for the rows you create. As a general rule, you can combine any of the tile placement variants suggested below with any of the scoring-method variants. It's up to you! In this variant, your first tile may be placed anywhere on your board. However, the second tile must be placed so that it touches the first tile along one edge (even where this forces you to 'break' a scoring row right from the start). All subsequent tiles must be placed so that they touch, along one edge, at least one other tile that is already on your playing board. This variant is more difficult than standard Take It Easy!, because your tile placement opportunities are restricted. As in the variant above, your first tile may be placed anywhere on your board. The placement of the second (and subsequent) tiles depends on the sun/moon symbol present on each tile. If the symbol on the second tile is the same as on the first (e.g.if both tiles are sun tiles), then the second tile must be placed so that it touches the first, as in the first variant described above. If the two tiles are marked with opposing (i.e.different) sun/moon symbols, then the second tile can be placed anywhere on the board. Similarly, with all subsequent tiles, if the sun/moon symbol matches that of the previous tile, then the newly-drawn tile must be placed such that it touches at least one tile that is already on your board. If the symbols do not match, then the tile may be placed in any empty space on your board. 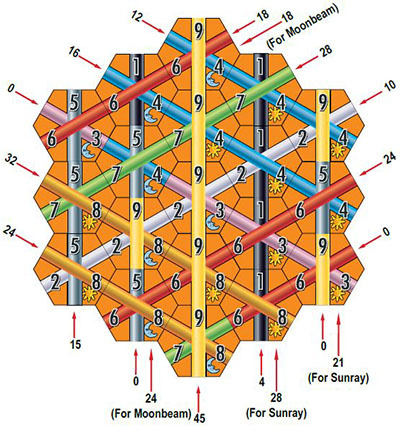 A Sunray is completed whenever you form a continuous, straight row of sun tiles right across your playing board in any direction. A Moonbeam is formed in exactly the same way as a Sunray, but using all moon tiles instead of all sun tiles. A Sunray or Moonbeam can be formed along a Scoring Row OR a non-scoring row. The color of the stripes contained within the row does not matter. If a Sunray or Moonbeam is formed along the same row of tiles as a Scoring Row, you will score the normal points for the Scoring Row AND the points for the Sunray/Moonbeam! For every Sunray you complete, score 7 points for each tile in that Sunray. For every Moonbeam you complete, score 6 points for each tile within it. These scores are added to the points you have obtained for normal Scoring Rows. The scoring in an example game of "Sunrays and Moonbeams" is shown below. Total score = 228 + 24 (Moonbeam) + 28 (Sunray) + 21 (Sunray) + 18 (Moonbeam) = 319. This variant is suitable for between two and six players. It involves a strong interactive element, as players are competing to have the 'best' Sunray, and the 'best' Moonbeam. For this game, Sunrays and Moonbeams only count if they are formed along Scoring Rows. A Sunray or Moonbeam along a non-scoring row is not valid in this version. Sixty bonus points are awarded to the player with the 'best' Sunray. Players each compare their best Sunray with those of their opponents. A Sunray on a longer Scoring Row will always beat one which is on a shorter Scoring Row. If two or more players have constructed best Sunrays that are the same length, then the one that is on the higher-valued Scoring Row will be the one that scores the sixty-point bonus. If two or more players have their best Sunrays on identical Scoring Rows (i.e. the rows are of exactly the same length and the same color) then these players share out the 60 points evenly between them. So if two players both have the same best Sunray, then they receive 30 bonus points each. If three players tie for the best Sunray, then they will receive 20 bonus points each (etc., etc).. Exactly the same rules apply to Moonbeams. At the end of each round, the player who has the 'best' Moonbeam will receive 60 bonus points, while if two or more players tie for the best moonbeam, they divide the 60 points evenly between them. 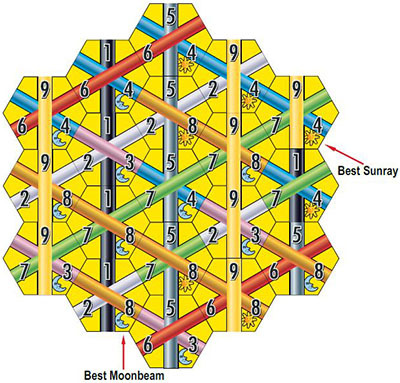 In the example shown below, the player's best Moonbeam is four tiles long and is on a Black Scoring Row. This would beat any opponent's Moonbeam that was only three tiles long, even if this three-tile Moonbeam was along a valuable Scoring Row such as Yellow. However, the four-tile Moonbeam on the Black Scoring Row would be beaten by an opponent's four-tile Moonbeam on a higher-valued color such as Orange. If at the end of a round, none of the players has created a Sunray along a Scoring Row, then no bonus points are awarded for Sunrays for that round. Similarly, if no-one has made a Moonbeam along a Scoring Row, then no bonus points will be awarded for Moonbeams for the round. The winner is the player who has the highest total after any bonus points have been added to each player's normal Scoring Row totals.